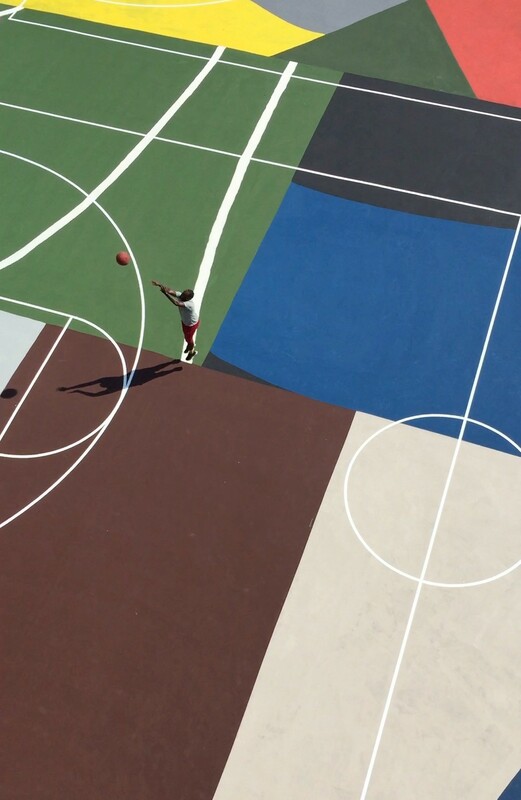 Dan Peterson turns run-down outdoor basketball courts into large-scale works of public art. A New York native, he founded the non-profit Project Backboard while living in Memphis, TN after noticing many of the city park basketball courts did not have lines. Dan started by simply painting free-throw lines, three-point lines, baselines and sidelines but soon began installing graphic backboards and painting murals directly on newly resurfaced courts. In addition to multiple courts in Memphis, Dan has worked on projects in Los Angeles, St. Louis and New York. Tell us a little bit about yourself and what you do. 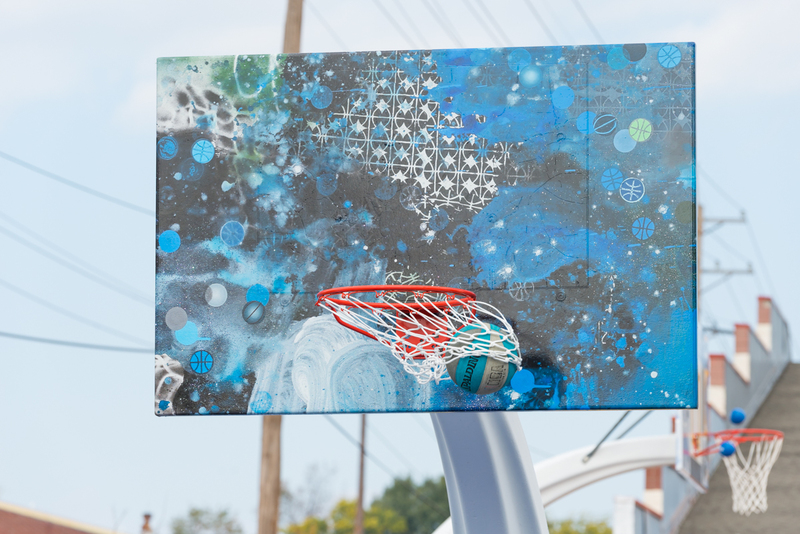 I started Project Backboard, a non-profit organization which takes public outdoor basketball courts in disrepair and collaborates with artists to turn them into large-scale works of art. Basketball is my first love, especially outdoor pick-up basketball, but I have always had an interest in art and community outreach. The creative discipline required for excelling at basketball or at art are not that different, and it is exciting to be able to create places for those passions to intersect. Top 3 favorite or most visited websites and why? www.projectbackboard.org! Email. Instagram has been a great resource for discovering artists online, keeping track of great basketball courts elsewhere and letting folks know what I am up to. How long have you lived in LA and what brought you there? I am from New York and started Project Backboard while living in Memphis but my wife is from Southern California and after our two boys were born we decided it was time to move closer to family (and the beach!) two years ago. What kinds of things are influencing your work right now? 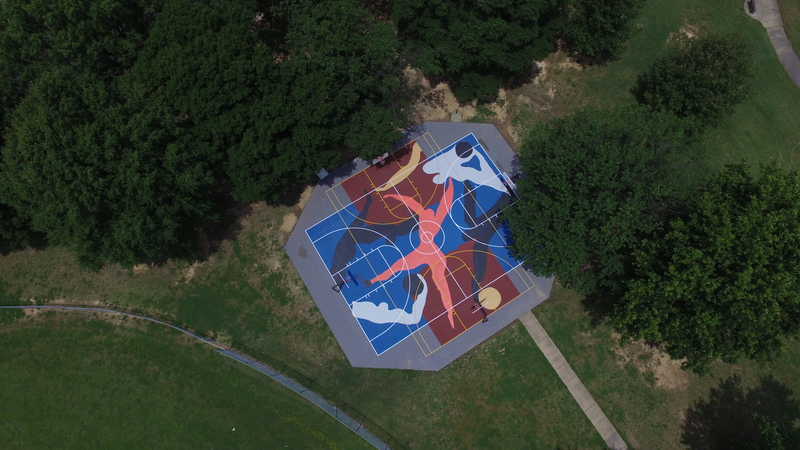 Artist-designed basketball courts seem to pop up more and more often and it is also always inspiring to see how other artists interpret outdoor basketball courts as a canvas for creative expression. That said, I have seen some of those painted courts deteriorate rapidly and my recent concerns have been around how to install vibrant works of art that can withstand the foot traffic the courts are intended to inspire. Two early influences that are still relevant for me are the 50ft mural of Lebron James in a Knicks uniform painted across a Rucker Park court when New Yorkers were hoping to lure him away from Cleveland and the original Pigalle basketball court, which featured a cartoon crowd full of celebrities and basketball icons over pastel geometric shapes. Those courts are a reminder to consider how a person with potentially little art background or exposure would respond to the color and images on their court, but at the same time I want to push people to broaden their perspective and engage in creative thinking. What are some recent, upcoming or current projects you are working on? The recent summer 2017 court renovation in Kinloch Park, adjacent to the St. Louis airport, has been a dream project. It is the largest artist designed basketball court that I know of, 175’ x 105’, and was recently recognized by Architectural Digest as the best designed basketball court in the world. 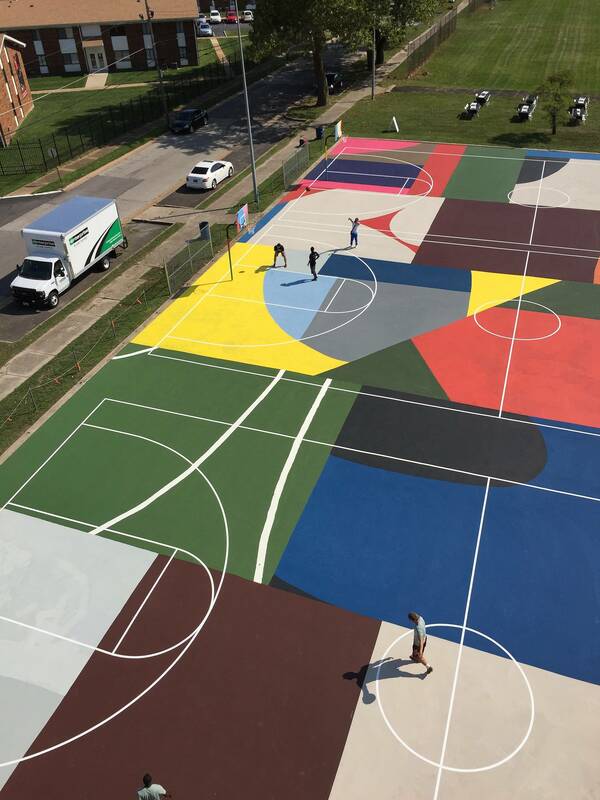 The court is based on a pieced canvas painting by St. Louis artist William LaChance. This project was a massive undertaking but the community of Kinloch was incredible. The court surface was crumbling and the lines were barely visible so we had patch cracks and resurface the courts first. As soon as we began to paint, current and former community members came out to show support and strangers showed up with their own rollers and brushes and got to work! At the end of the week we hosted a huge community block party and played ball until it was too dark to see. As a bonus, on my flight out of St. Louis, I looked out my window from a few hundred feet up and saw the court from the air as we took off. It has inspired me to think more about where my work fits between mural painting, landscape architecture and even land art. How did your interest in your work begin? I started Project Backboard in Memphis because over half of the public park courts in the city had no free-throw line, three-point line or out-of-bounds lines. I grew up in New York playing outdoor-only leagues all summer long and couldn’t believe the condition of the courts in Memphis. I crowdfunded some money, bought a stencil, got permission from the parks department and started painting all over the city. 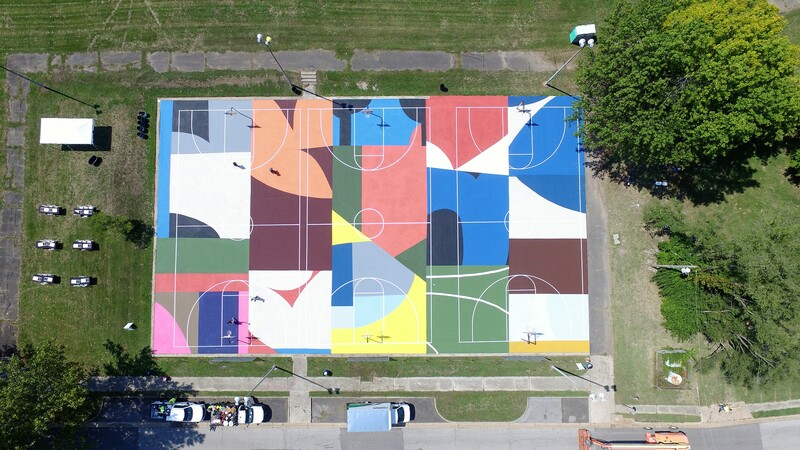 Eventually I began adding artwork to the courts both on the surface and on the backboards, where I used work by artists like David Huffman and Kevin Couliau to cover old Coke logos that had been applied across some Memphis park backboards in the early 1990s. I was fortunate that from the beginning artists recognized what I was trying to do and have been very willing to collaborate, resulting in amazing outdoor courts designed by artists like Nina Chanel Abney and Nick Dahlen. Who would you ideally like to collaborate with? There are so many incredible artists whom I would love to collaborate with, certainly more than I have courts with permission to paint! I designed some of the early courts but it is much more rewarding to work with others, so if you are an artist who is interested in this work please reach out through my website or Instagram. I believe basketball is a beautiful game and there will be historically significant art that references it. I do wonder, what if basketball was started in Europe 500 years ago and Michelangelo, Degas or Matisse had the opportunity to be influenced by the game? Ideally, I want to be putting work that is happening now, of that caliber, with that kind of energy and weight, in public parks on basketball courts. What do you want a viewer to walk away with after experiencing your work? Two things, (1) I can’t wait to get more of my friends and family to come and play on these courts again and (2), if a basketball court can look like that, what else is possible? It is one thing to take a rundown basketball court and simply make it playable but the goal of Project Backboard is to get people active together and inspire multi-generational play. I want parents to bring kids to see a court and shoot some hoops, I want teens to get into pick-up games with old-timers. I imagine families picnicking and students reading books all around. My other hope is that the scale and unexpected nature of these works jolts viewers’ expectations in a way that allows them to think beyond whatever their current circumstances may be. If a public outdoor basketball court can be a 175’x105’ canvas for a museum-quality piece of work, what else can be dreamed into existence? What’s your absolute favorite place in the city/the world to be? It can be just about anywhere, but outdoors with my family is my favorite place to be. What are you really excited about right now? One project that I am very excited about is a collaboration with Scott Albrecht for two courts in a park in New Rochelle, NY which will hopefully be completed in Spring of 2018. Beyond that I am just interested to see how Project Backboard continues to grow and where it will take me. Most embarrassing moment? For whatever reason, I don’t embarrass easily. I am sure my wife or kids can tell you of many times they have been embarrassed on my behalf but I try to focus on what lies ahead and keep moving forward. What were you like in high school? Generally devoted to my basketball obsession. I would watch the great 1990s Knicks teams and run outside during TV commercials to play five minutes of basketball. I would shovel snow from the driveway and work on my handle wearing soaking wet, thin-knit, winter gloves. I would go to the new outdoor court built adjacent to the school and shoot in the dim glow of the building’s security lights until the cops invariably shooed me away sometime after midnight. Can you share one of the best or worst reactions you have gotten as a result of your work? “We should play full court.” “The court feels bouncier now!” Some paint purposefully applied on a basketball court really changes perception of the space and because I am interested in getting people active and I love running full-court pick-up myself, those are my two favorite reactions which I hear after every project. Before starting any project, I try to brace myself for potential pushback or negativity but remarkably it has never come. I think what people quickly figure out is even on a court with busy color fields and painted backboards, once you start to play everything fades into the background only to reappear when you are waiting for the next game or just hanging in the park.